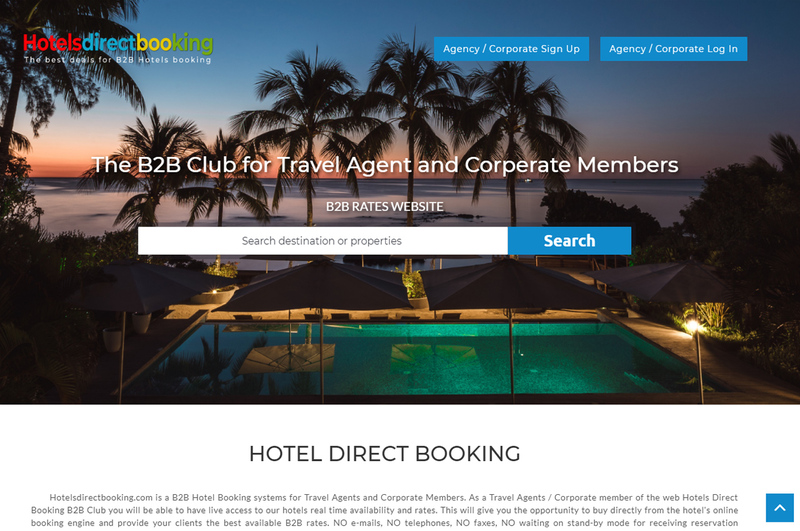 Hotelsdirectbooking.com is a B2B Hotel Booking systems for Travel Agents and Corporate Members. As a Travel Agents / Corporate member of the web Hotels Direct Booking B2B Club you will be able to have live access to our hotels real time availability and rates. This will give you the opportunity to buy directly from the hotel's online booking engine and provide your clients the best available B2B rates. NO e-mails, NO telephones, NO faxes, NO waiting on stand-by mode for receiving reservation confirmations. Save time and money and provide your clients the most accurate information about the hotel. Get access to the best direct net hotel rates, use your credit card to pay for your client’s reservation and get instant confirmation!! By joining with www.Hotelsdirectbooking.com. Register Now and start connecting directly with hundreds of hotels best loved brands. All Hands Marketing is a leading company for hospitality industry professionals and developer of premium internet marketing solutions in Thailand.